Two rounds of the 2019 Six Nations down, three to go. And there are more changes in personnel in ESPN’s Fantasy Rugby team of the week than there were in the Welsh team for the trip to Rome. 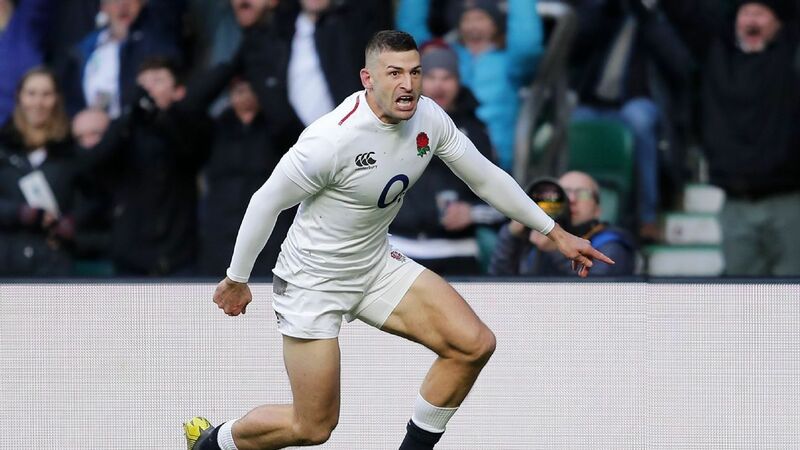 In fact, there were 14 changes from last week, with only England’s Jonny May keeping his place in the ToW starting XV, courtesy of his half-hour hat-trick against France on Sunday. Five tries in five Six Nations matches coming into Sunday became eight inside 35 minutes of six as the Leicester man had a field day at the expense of a thoroughly miserable France. May now has 35 points in two games – and the eternal gratitude of 40.8% of Fantasy Rugby managers who have him in their team. Proof that decent performances don’t always get the Fantasy Rugby recognition they deserve. That line, that touchdown will be a contender for try of the tournament when these things come up for grabs in March – and the Ulster player’s rapidly improving defensive work will have delighted Joe Schmidt. He cleaned up Scottish kicks all afternoon, and made a couple of vital tackles when the Irish line was under threat. The England captain – listed as a centre in Fantasy Rugby, but back at the key 10 position on the field – did everything you’d expect. He scored one try, made another, kicked three conversions and two penalties, and did his fair share of defensive work. The only French player in ESPN’s Fantasy Rugby team of the week – no surprise really, given Les Bleus’ dismal performance on Sunday. Defensively, he was all at sea, but with ball in hand he was France’s most dangerous threat … not that it was a high bar … making 85 metres and scoring their only try. A much better performance all round, this week, from Ireland against Scotland – and scrum-half Murray did his part with a try, and a conversion, as Johnny Sexton was getting treatment. Still not quite the high standard we’ve come to expect, but getting there. A big defensive shift from the Scotland loosehead, as he made more than 20 tackles in 68 minutes before being replaced. Also took his chance to introduce himself to Ireland’s Johnny Sexton with a big and just slightly late hit early on. Giving away a foolish penalty for slapping France’s Arthur Iturria will have been noticed by the England staff – but so will a strong performance in the scrum, two powerful runs – and that lovely pass for Henry Slade’s try. In Fantasy Rugby, multiple tackles score points – and Gray, as he always does, tackled his way from can till can’t. He made 25 against Ireland in another dogged defensive shift. We need to talk about Josh. He was the best-performing forward in the Wales team by some margin. Excellent defensively, and a real danger with ball in hand. Italy’s Sergio Parisse is a couple of years passed his best, but few opposition eights get the better of him quite as comprehensively as Navidi did at the weekend.